Muller heads the TRACER (Transition Radiation Array for Cosmic Energetic Radiation) project, designed for balloon-borne measurements of heavy cosmic-ray nuclei. TRACER is currently the world's largest instrument for cosmic-ray observations above the atmosphere. It flew successfully for 14 days on a 5,000-mile orbit around the South Pole in Antarctica in 2003, collecting more than 50 million heavy cosmic rays at an altitude of 125,000 feet, and in 2006 is preparing for another long-duration flight along the Polar circle in the Northern Hemisphere. These experiments, which were begun in the 1980s with a detector onboard the space shuttle Challenger, and which are funded by the National Aeronautics and Space Administration, provide the most detailed current information on the cosmic-ray composition at extreme energies. 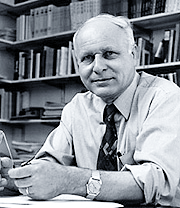 Muller also was the leader of the HEAT (High Energy Anti-matter Telescope) collaboration for the detection of anti-matter particles in the cosmic rays, and he is a collaborator in the CREST (Cosmic Ray Electron Synchrotron Telescope) program to search for cosmic-ray electrons at extremely high energies. KICP Talk, Dietrich Muller, University of Chicago, "HUNDRED YEARS OF COSMIC RAYS: Some Reflections on the Research in Chicago"